On Christmas day 2011 DB Member "Puritania" asked if I could possibly complete my Gotham Garden seasonal series by adding a winter version. It took me about a year to get back to it but I am happy to report winter has finally come to Gotham. The changes needed for winter are a bit more complicated than for the warmer seasons but I think it turned out pretty well. I hope you enjoy it. I will try to have the multiscreen up shortly! If I had to rate/rank your work this would likely make number 1 for me. I'm kinda (extremely) partial to snow scenes and I really like the Gotham stuff. Even Gotham has its winters! This render is spectacular! Batman himself would appreciate the view. Thank you so much for completing the series with the winter version. It was well worth the wait. The falling snow provides movement that is most appealing. I really like this one. It is quiet and calm but doesn't lose the darkness of Gotham. The green in the bushes is perfect. Sorry you feel that way. Perhaps I am a bit over-protective of my print-res renders. Anyone possessing them could pretty much set up their own poster store of my work however. I'm not saying that you or any Member would do such a thing, but I imagine that someone downloading the inevitable Torrent might not be so scrupulous. 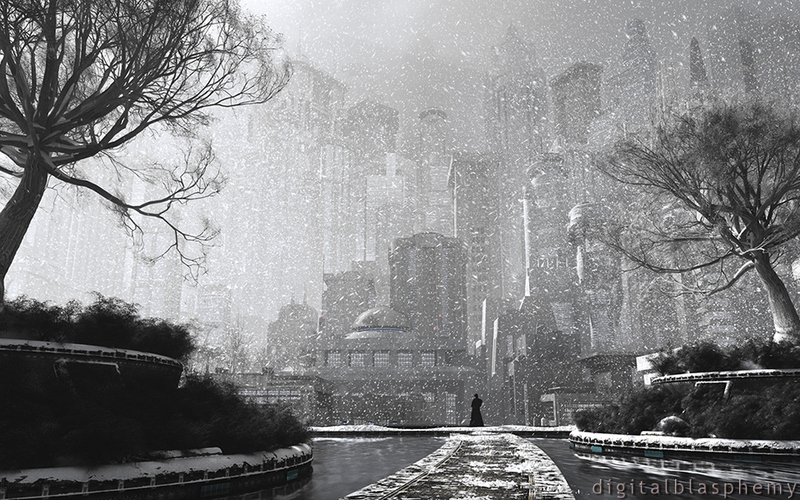 I've added a new single-screen render this morning which has snowflakes in the foreground. I've also added a poster version to my Zazzle collection here. Does this version work better? So I finally put this up on my screen. I like it at first glance.... but the lack of snow falling in the foreground will nag at me. I mean I actually love the blasphemy part of your work (as in not naturally occurring) but was curious about this odd layering of snow fall. It looks like there was a file transfer error when I uploaded it. I am re-uploading it now so maybe try again in 10 minutes or so (my internet is so SLOW!). "Gotham Garden triscreen split files error"
The zip file for Gotham Garden (Winter) seems to error on unzip. I've downloaded it 3 times now. Is there a problem? If you look closely you will notice that some of the buildings do have their lights on. I love the black & white! Great render! The muted look is perfect for a daytime snowstorm. This makes me think of being inside on a day when it is snowing. I don't think pumping up the color saturation would yield a believable image: what people are suggesting is just not what a snowstorm looks like; this is. Perfect atmospheric piece, IMHO. But I do agree with Ken F that more snow in the foreground would be nice. "Borrow textures from Gotham Spring?" Gotham Spring has buildings lit in blue, red tower control beacons, a good darkened shade of bark for the trees, uplighting, walkway lighting (natural in winter - might also be neat to have lights running along the walkway itself pointing down onto water causing reflections or onto the path) - you could probably pull a lot of Gotham Spring's textures straight across into this render to add color! "Agree - more color would be great"
A night version would do it for sure. I think the Autumn render is the best in the series because it has a powerful lucid set of colors; this one is very interesting but almost conveys too much of the drab of winter without its magic. I like the blue lights if they were integrated into a whole that's much more full of colors. More building color, more icicle blue, more bark color in the trees and possibly lights inside the windows. Great render nonetheless! "Great render to close out the series, but..."
... it appears to me that all of the snowflakes are confined to the area passed the figure in the middle ground of the image. Is this the case or am I just seeing things?? It would only seem natural that there should be snowflakes falling in the foreground as snow is present already in the image there. Just don’t see any flakes in front of the trees, figure, etc. Then again who am I to criticize your works as I am dazzled once again by your talent. Wishing you and yours a very Happy New Year!! "I have always loved the Gotham series..."
...but I have to agree with Dylan almost word for word. Too muted, needs more color. That, and the bluish lights near the water just don't look right. "Great entry in the Gotham Garden series." My thoughts echo some of the other comments here...this has some fantastic shades of gray, and I especially like the accentuation of colors here and there. I'd love to see a Pickle Jar variation of this with a bit more color saturation to it...this, while conveying a wonderful sense of atmosphere, strikes me as a bit too abrasive in how washed out it is, and I'd like to see less muted colors in the buildings and foliage. I like this render and think Nico's suggestion of a night version with the building lights on would be awesome - a good counterpoint. "Wonderful way to finish this series"
The Gotham series has, in my opinion, been some of your best renders. Love this one. Great touch of color. I like that there's these intense flurries, but you kept them back enough so we can see excellent details in the foreground. 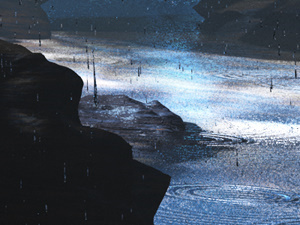 We get the effect of a whiteout without losing the details of the scene. I have the Night Gotham as my desktop at work and I must say, somedays I find myself staring at it when I want to escape. This one is going up next! Thanks! Nice to see another (almost) monochrome render from you. With this one, taking out the color goes along perfectly with the winter mood. I must say it's great to have a complete set. I would like to make one suggestion, or rather give you something to ponder. The snow flurries. They look like, remind me of, scenes of NYC or any large city. However, if the flurries are as "thick" as they appear in the background, wouldn't they also be in the foreground? The snow flurries seem to stop behind the person figure. Much like a sheet of rain does when seen moving across the landscape. So if that was what you intended ... Bulls-eye, you nailed it! If not, hmmm ... maybe a few more flakes between us (the viewer) and the foreground trees and the person. Perhaps a pickle jar idea. nice almost a total white out possiably have it dark with the building lights on? Not my favorite but cool. Nice, though it'd be nicer if the city was a bit more visible. I'm happy you completed this series. Well worth the wait! Something truly haunting and beautiful about this image. I hope it becomes a poster soon...one of your very best images yet. The 'Gotham' series has been one of my favorites, so glad to see the series completed! Wonderful job! Happy New Year, Ryan, to you and your family, and to all the Digital Blasphemy fans! Love it! Looks like Neo standing in the picture waiting for Smith. Oh man, one of your best winter scenes! Love the snow flurries.